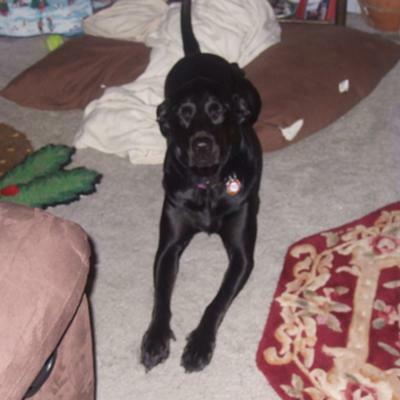 Maggie is an seven year old Pit Bull and Black Labrador Retriever mix. Our family adopted Maggie as a 3-month-old puppy from one of the North Shore Animal League's mobile adoption units. We were looking for a small dog for our family's first dog, so we took home the cutest little "Terrier-mix" that they had. They told us she was going to be no more than thirty pounds. Little did we know that her breeds were a mix of Pit Bull "Terrier" and Black Lab. Or that she would grow up to be a healthy eighty pounds! We didn't know much about Pit Bulls when we adopted Maggie, but I did have some friends who had Pits and Pit mixes, and I knew they were some of the sweetest and most friendly dogs I had ever met. And Maggie is no exception. She's friendly, gentle, loyal, playful... pretty much everything you can ask for in a dog. She tends to get pretty wound up at times and needs to take a break to relax, but that's just because she loves to play so much. After having lived with Maggie for so long, I don't know how we could ever not have a Pit Bull as part of our family. Pits are just about the best breed of dog a family can have.